Acupuncture & Acupressure are using the same pressure points and meridians. 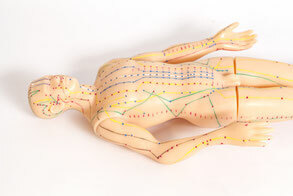 Acupuncture however employs needles, while Acupressure only uses gentle to firm finger pressure. Acupressure points have a lower electrical resistance than the surrounding skin therefore acupressure points can now be located also with electronic tools that measure electrical skin resistance. When acupressure points are stimulated, it helps releasing muscular tension, promotes circulation of crucial body fluids, and enhances the life force energy to aid self healing. Acupressure can be used to relieve pain, to fortify the reproductive system, to detoxify the body for greater health and beauty, and relax and balance facial and back muscles. Human soft internal organ systems are connected with bones muscle and flesh by major energy channels and small connecting vessels. Locations on the body where these energy pathways are close to the surface Asian culture have identified thousands of years ago.